[2011.10.14] 不支援Windows XP 32位元只支援3.25GB的剩餘空間利用！Can RAMDisk use memory not available or seen by 32-bit Windows? 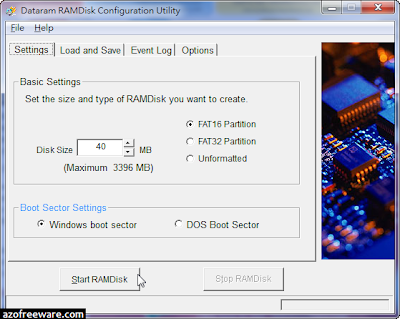 Dataram RAMDisk cannot make use of memory that is not available in 32-bit Windows systems between 3 and 4 GB. RAMDisk can use memory not "seen" by 32-bit Windows ABOVE 4 GB, i.e. 6 or 8 GB. RAMDisk is Freeware (up to 4GB disk size). It creates a virtual RAM drive, or block of memory, which your computer treats as if it were a disk drive. By storing files and programs into memory, you can speed up internet load times and disk-to-disk activities, accelerate databases and reduce compile times. Save and load features allow RAMDisk to appear as persistent storage, even through reboots.